Despite the constant flow of new typefaces, every designer likes to pay homage to the classics from time to time. This fact is underscored by the hundreds – if not thousands – of retro fonts available across the web. There are other massive font roundups out there that tackle this same topic. However, we don’t want to overwhelm you, so we decided to make this a carefully curated list and only mention high-quality fonts that truly capture the essence of a bygone era. We selected each of the fonts below with two criteria in mind: a retro look based on past art styles and fashions, and high quality – which is to say, these are fonts that we would feel comfortable using ourselves. To round up these 30 entries, we scoured the web and ended up at several popular font haunts that many of you will be familiar with, such as Dafont, Google Fonts, and My Fonts. The latter repository presented a small problem, though. Its prices are set in Euros, and we like to include prices in US dollars on our lists – so we’ve converted those for you, rounding up or down when necessary, hence some of the odd numbers found below. With that in mind, let’s begin our journey down memory lane. To use these fonts with any WordPress theme, including Divi, use the plugin use any font. Riesling is a unique and playful font with long, looping tails, slanted eyes, and an overall airy feeling to it. It was inspired by Art Deco and created by the now defunct Bright Ideas foundry, which went out of business during the early 2000s. Echo Deco is another Art Deco inspired font. This one stands out thanks to the unique detail applied to each of its lines. The letters that make up this font consist of solid figures combined with a mix of thick and thin strokes that work together to create an interesting visual effect. Bellerose Light is an Art Deco font with solid pedigree. It’s been downloaded over 3,000,000 times worldwide and is used by renown companies such as Mattel and Simon & Schuster. This font pays homage both to the timeless French capital and its classic typography, and it wouldn’t look out of place on the billboard of a theater or a cafe’s menu. Allstar is a tribute to the classic athletic lettering that was so commonplace during the 90s and remains popular to this day. This big, geometric font is a great fit for any sport-themed design. This is the classic Hollywood Hills font on a much smaller scale. The lettering is instantly recognizable, making Hollywood Hills a perfect fit for media websites or designs for the film industry. Dancing Script is a tribute to several popular typefaces from the 50s. It’s a lively font in which each letter varies slightly in size, giving it an attractive, casual look. Despite its whimsical name, Cookie features a classic style based on brush calligraphy. It’s author designed it with ad and pin-up styles from the 50s in mind, and it’s easy to conjure up images from this era while considering Cookie’s simple strokes. Monoton is a unique take on the metal press fonts of the early 1930s. Its imposing lines would look right at home on a neon sign and it’s a great choice for large display lettering. Tangerine was inspired by 16th and 17th-century italic chancery hands – a cursive style of writing that was originally developed within the Catholic Church in the 13th century and used to notate business transactions, and which would later serve as the foundation for modern italic typefaces. Sacramento is an elegant typeface with a commanding presence. It was inspired by artist brochures from the 50s and 60s and consists of an eye-catching mix of casual and formal strokes that work well for page headings. FontleroyBrown is a dignified font with longs stems, curled serifs, and looped tails. All these features come together harmoniously for a typeface that is well-suited to titles or logos. 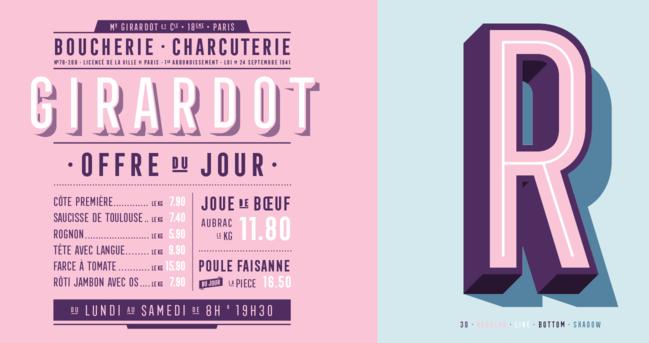 Graphique Pro Next is a modern take on the famous Graphique Pro font of 1945. The heart of this typeface lies in its narrow style, which – combined with the slanted lines of its shadow – results in an energetic look that’s perfect for a logo. Lichtspiele was the name given to cinemas in 20th-century Germany. 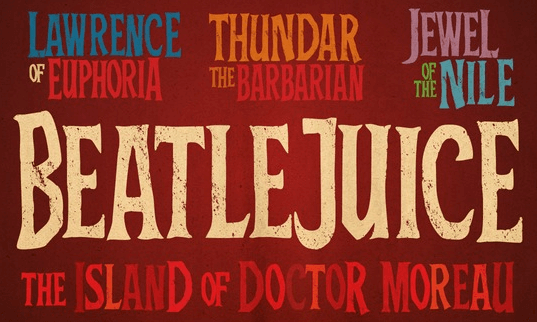 This font pays tribute to that era of film with its neon-letter style. It’s the perfect typeface for film buffs with a penchant for design. This font will bring back memories for those of you that remember playing arcade games in the 1980s. It’s bitmap typeface is based on the designs of that era – uppercase letters are based on Atari Sprint from 1978, and glyphs are inspired by Return of Ishtar from 1986. Due to its nature, this font works best when used in pixel sizes that are multiples of eight (i.e. 8px, 16px, 24px, and so forth). UnifrakturMaguntia is a gothic font with several ancestors. It is based on the work of German artist, Peter Wiegel, who in turn based his work on a 1901 typeface by Carl Albert Fahrenwaldt. This unique font is a solid choice for medieval designs. Rospi Clean and Retro is a simple font family with accentuated kerning that takes cues from newspaper ads and flyers from the 30s. 19th Century Retro is a modern re-design of a classic font called Fraktur, which was used for official documentation during the early 19th and 20th centuries. True to its name, it features a simple retro design that wouldn’t look out of place hand lettered on parchment. Lulo Clean is a three-dimensional, all-caps font that would look fantastic as a logo. This retro design with layered shadows is based on the designs of old circus flyers. 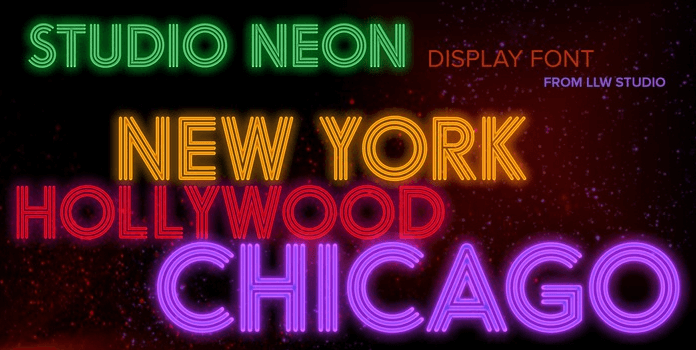 This layered typeface was born of a mix between retro and neon signage. Its letters are narrow and have ample kerning, which provides a robustness that’s perfect for imposing designs. Hollie ScriptPro draws inspiration from the classic strokes of brush lettered magazine advertisements and window signs dating back to the 50s and 60s. It also comes highly recommended – the Type Directors Club awarded it with the Certificate of Typographic Excellence 2015. We return to Art Deco once more. Pontiac Inline is a clean font with soft curves and a slender inline that achieves a perfect mix of modern and retro. Ahkio is an impish font family with roots in signage and showcard design from the 1930s . Its letters feature a subtle slant and sinuous curves which give it a robust handmade feel. 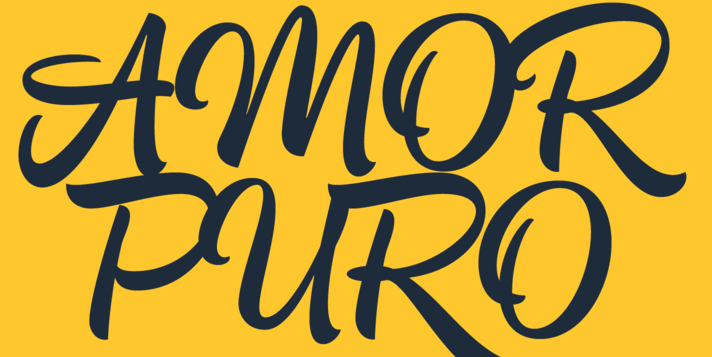 Dynascript is an odd combination – it features a retro take on modern lettering – but it works. It’s easy to imagine advertisers from a bygone era using Dynascript to talk about the wave of the future. Baboon is an aggressive font with rough angles that takes inspiration from homemade church banners of the 70s and vintage horror movie posters – an odd mix to be sure. It’s a splendid choice for monstrous applications such as Halloween-themed designs and book covers in the horror genre. Typewriter Revo is the lovechild of classic newspaper lettering and typewriter fonts. It’s a sober font with thick lines and soft corners, perfect for large batches of text in your designs or for simulating the look of top secret documents. Di Mare is a layered font family with a sizable inline, a playful slant, and pronounced loops. Its creator was inspired by the lettering of Italian cafe and restaurant signs. Keep it in mind the next time you help a cafe or sit-down restaurant with a design project. MB Deco is a sleek Art Deco typeface with slender characters and interesting ligatures. It’s a solid pick for logos and headlines if you’re a fan of retro minimalism. We’ve covered several neon-based fonts already, but none as transparent in paying homage as Studio Neon. This all-caps font feels as if it was ripped right off a giant sign at an old-time film studio or theater. The last entry in our roundup of retro fonts is Filmotype Lakeside. The painted brush strokes of advertisements from the 50s greatly influenced this approachable typeface. What is your favorite retro art style and why? Share your perspective with us in the comments section below and don’t forget to subscribe so you can follow the conversation! Another font that I’ve always liked that can fit in with the retro style is Graduate, based off of varsity-style typefacing. Great Collection of fonts, I’d like to suggest to add another great resource for font “Font Squirrel”. I agree. Font Squirrel is awesome! Many thanks John for this cornucopia of great designs ! For a Single Activation $0.00 purchase they still want my credit card info. Sounds shady. 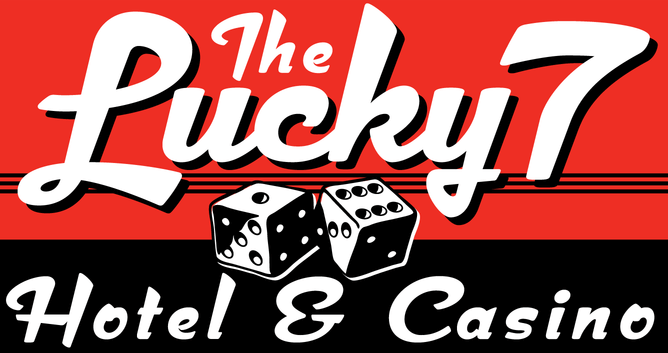 I love MB Deco, it is such a retro timeless font….thanks for sharing these. Why does Elegant Themes insist on pushing all sorts of tricks and fancy stuff instead of offering the most commonsensical arrangement for me? I want to post posts that I have already created in Microsoft Word in various styles of a very famous font, Times New Roman. Why not allow that? Please do not say that this is already available on Elegant Themes. I know it isn’t. Please do not blame WordPress. Instead Elegant Themes should tell WordPress to make this simple and obvious way forward available. Thanks. I think the issue lies with what you’re expecting WordPress to offer you. Font choices are based on the theme you choose, and there are plenty of themes that offer the Times New Roman font. In fact, we’ve also shown how to add these to any theme elsewhere (https://www.elegantthemes.com/blog/tips-tricks/how-to-use-google-fonts-on-your-wordpress-website). You’ll run into issues if you’re looking to copy and paste text into the WordPress editor directly from a Word document. You’ll have to paste it as plain text, but that won’t save your stylings. This isn’t fixable by WordPress or Elegant Themes, sadly. WordPress is open source with thousands of independent contributors worldwide developing and contributing things they want to see offered instead of expecting others to carry their water. Perhaps you could consider going in that direction to achieve your goal. Elegant Themes ‘tell’ WordPress to do something? Sounds kinda silly. I am pretty new to Elegant Themes, and have to say I love the breadth of the blog postings. Your bloggers are showing me so many great tools and tips – I appreciate it! Elegantthemes are awesome. They are now comeup with these 30 retro fonts. Some of them are very latest. Dying to use Typewriter Revo. For a limited time, the Graphic Pro Nex font you’re talking about is 5,8 € instead of 29 €, 80% off.